My San Fernando Valley construction company’s specialty is making homes more green and eco-friendly. If you live in Studio City, there are many projects you can do to make your home greener. Installing eco-friendly upgrades is not only good for the environment, as you can save electricity and water, but good for your wallet, as you will also save on your monthly utility bills. Here are three tips on making to the exterior of your home to make it greener. 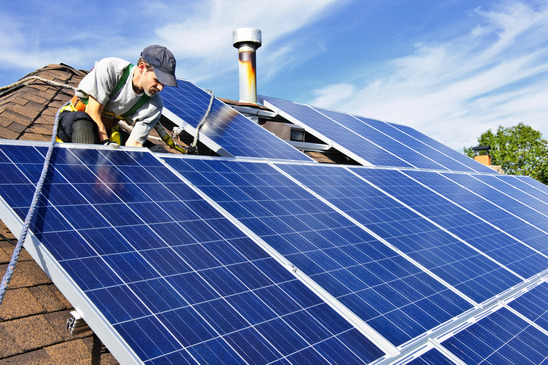 Solar Panels – I recently wrote a blog about solar panels, where I explained what households they would be best suited for. In a sunny place like San Fernando Valley, solar panels are always a good investment. Solar power returns money on your investment every single month. Right away, your electricity bill will become much lower, as you will be generating solar rays to power your home. However, installing solar panels is a big investment. Not only do the solar panels and their installation cost thousands of dollars, but also some homeowners have to make significant and costly upgrades to their Studio City home in order to be able to utilize solar energy. Repaving – As California is currently having a drought, it is important to do everything we can to save water. One of the ways our San Fernando Valley construction company has been doing that is with green repaving services in Studio City. Consider adding permeable paving, which is porous material that is used for lawns, driveways and sidewalks. These sustainable pavements allow storm water or excess water from sprinklers to be absorbed back into the ground. This prevents run-off water, saves rainwater and traps pollutants into the layers of the pavement. Windows – One of the biggest green exterior and interior improvements you can make is to update your windows. There are many types of windows to choose from for your particular needs. Top-of-the-line windows will shield outside noise from infiltrating your house, and will trap more air inside, keeping the heat out. ENERGY STAR-certified windows are guaranteed to save you money on your electricity and gas bills because they will prevent your home from heating up too much in the summer, and cooling down too much in the winter, allowing you to use less of your air conditioner and heater. Plus, newer windows will greatly improve your house’s look. Hugs Construction has over 20 years of experience and is a full service construction company in the San Fernando Valley and surrounding Los Angeles area. We work on projects of all sizes, such as kitchen and bath remodeling, wiring and electric work, soundproofing, installing windows and doors, specialty projects and new constructions. To get a quote for your green outside renovation, contact us.